Is brain size related to eating disorders? University of Colorado researchers discovered that girls with anorexia nervosa had a larger insula, a part of the brain that is active when tasting food, in comparison to girls without the disorder. They also found evidence of a larger orbitofrontal cortex, a part of the brain that signals when to stop eating, in anorexic girls. “The negative correlation between taste pleasantness and orbitofrontal cortex volume in individuals with anorexia nervosa could contribute to food avoidance in this disorder,” wrote the authors in their study newly published in The Journal of the American Academy of Child & Adolescent Psychiatry. After assembling a group of 19 adolescents with anorexia nervosa and a control group of 22 healthy girls, Dr. Guido Frank, assistant professor at the University of Colorado's School of Medicine, and his colleagues used magnetic resonance imaging (MRI) to study gray matter and white matter volume. The researchers also employed diffusion tensor imaging, which can reveal abnormalities in white matter, to assess brain tissue integrity. Finally, they compared their results to similar studies of both adult individuals with anorexia and a group of healthy volunteers. What the researchers discovered was, compared to the healthy control group, individuals with anorexia had greater left orbitofrontal, right insular, and bilateral temporal cortex gray matter volumes and greater temporal lobe white matter volumes. Generally, the temporal lobe is involved in processing sensory input. The right insular sorts out taste perception and also integrates body perception. Because of the abnormality seen in these areas, the researchers of this study suggest that these brain areas may contribute to the perception of being fat despite being underweight. With regard to the orbitofrontal cortex, this is the region of the brain involved in decision making. In fact, previous studies have identified the medial orbitofrontal cortex as the area of the brain that “signals” a feeling of being sated by a certain type of food. The results of this study, then, suggest that the larger volume in the orbitofrontal cortex fosters the abnormal behavior of anorexics. Perhaps, the researchers noted, it is this enlarged brain area that prompts anorexics to stop eating before they’ve had enough food — sooner than a healthy individual would. Significantly, this bigger-than-normal orbitofrontal cortex is not a characteristic of anorexia alone, but can be found in a variety of eating disorders. In a previous study, a group of researchers led once again by Frank found evidence indicating the reward circuits in the brain are sensitized in anorexic women and desensitized in obese women. In fact, their research suggested that eating behavior may be related to dopamine pathways, the same neural networks involved in addictions. Because, within rodents, it had been proven that food restriction and weight loss are associated with greater dopamine-related reward responses, the researchers sought to study the same brain processes in humans. 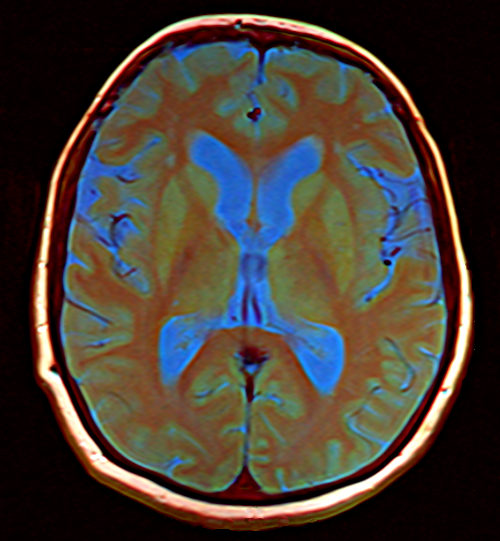 To do so, Frank and his colleagues turned to functional magnetic resonance imaging (fMRI). With this technology, they examined the brain activity of 63 women who were either anorexic or obese and then compared the results to the brain activity of women considered a "normal" weight. How exactly did they design the experiment? The researchers relied on a familiar task associated with understanding dopamine function in the brain: They conditioned the women participants to associate certain shapes with either a sweet or a non-sweet solution and then the researchers expectedly or unexpectedly provided the taste solutions. During the experiment, an unexpected sweet-tasting solution resulted in increased neural activation of reward systems in the anorexic patients and decreased activation in obese individuals. "It is clear that in humans the brain’s reward system helps to regulate food intake," Frank stated in a press release. Although these networks function in anorexia nervosa and obesity, the specific mechanism and reasons for this have not yet been made clear. Sources: Frank GKW, Shott ME, Hagman JO, Yang TT. Localized Brain Volume and White Matter Integrity Alterations in Adolescent Anorexia Nervosa. Journal of the American Academy of Child & Adolescent Psychiatry. 2013. Frank GKW, Reynolds JR, Shott ME, et al. Anorexia Nervosa and Obesity are Associated with Opposite Brain Reward Response. Neuropsychopharmacology. 2012.